"Hey, Hey, What Can I Do" is a song by the English rock group Led Zeppelin, released in 1970 as the B-side of "Immigrant Song" outside the United Kingdom. It is the only non-album track the band released before their 1980 breakup, appearing on the Atlantic Records UK various artists compilation LP record, The New Age of Atlantic, released in 1972. The song was first released on CD in September 1990 on the 4-CD Led Zeppelin Boxed Set collection. Initial 7-inch single pressings of the song featured a long gradual fade that ends abruptly with acoustic guitar. Subsequent pressings had a quicker fade, presumably to avoid the sudden end. This is the version that has been featured on every CD release prior to 2015. The 2015 expanded edition of Coda features an even shorter fade, excising the acoustic guitar ending altogether. 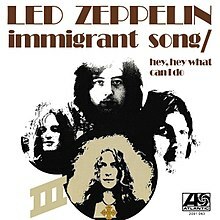 In 1992, as a 20th anniversary release, "Immigrant Song"/"Hey, Hey What Can I Do" was released as a "vinyl replica" CD single. In 1993, "Hey, Hey What Can I Do" was included on The Complete Studio Recordings 10-CD box set, as one of four bonus tracks on the Coda disc as well as the subsequent 12-CD Led Zeppelin Definitive Collection box set released in 2008. In 2015, the song was also included on disc one of the two companion discs of the reissue of Coda. Led Zeppelin never performed the song in concert; however Page and Plant performed it in 1995 and 1996 on the accompanying tour for their 1994 live album No Quarter: Jimmy Page and Robert Plant Unledded. Page also performed the song with the Black Crowes for their 2000 album Live at the Greek. ^ George Case. Jimmy Page: Magus, Musician, Man: An Unauthorized Biography. Backbeat Books. p. 103. ISBN 978-0-87930-947-3. ^ Nigel Williamson (2 August 2007). The Rough Guide to Led Zeppelin. Rough Guides Limited. pp. 214–. ISBN 978-1-84353-841-7. This page was last edited on 6 April 2019, at 15:33 (UTC).